The 25 Hours of Thunderhill is the longest and most grueling endurance race in North America. Success isn’t merely dictated by power, performance or driver talent, creating a package that can keep a decent pace with full reliability is what really counts. And that’s exactly what the folks at Yost Autosport in Las Vegas have created with their entry for this year’s race, which is happening on the 3rd and 4th of December. Right before SEMA I had the chance to drop over to their shop a short drive from the Strip, and check out the BMW before it was rolled into the Las Vegas Convention Center. I was keen to see how an M4 street car had been completely transformed into an endurance racer. First up, the engine. BMW’s new-breed of turbocharged inline sixes are pretty impressive; from the more normal versions that are used right across the range all the way through to the beast that powers the M4, there’s a lot to like. But with impressive torque response and power delivery comes a whole new level of complexity. Anyone that has worked on one these new engines will tell you that dealing with the electronics, dual-clutch transmission and active rear differential is a monumental headache. To get around this, Yost has fitted a MoTeC-based system using the stock wiring, in the process eliminating extra cabling that would only add extra weight. 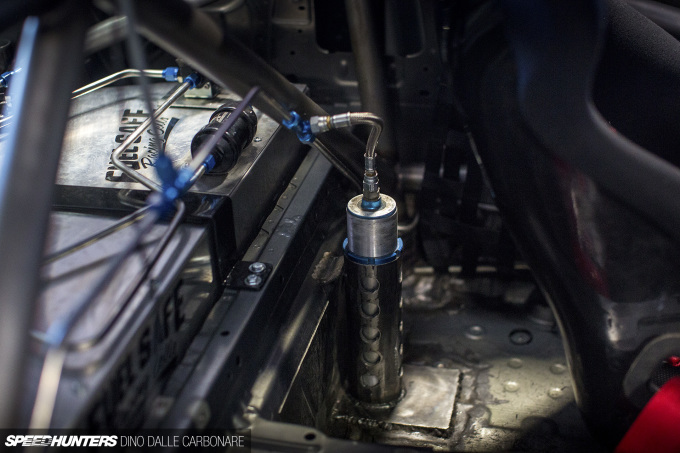 On the mechanical side of things, the car and its engine will be the testbed for a new prototype air-to-liquid charge-cooler that guys at CSF and VF Engineering have co-developed. It’s called the ‘Game Changer’, and with a name like that you know they aren’t joking around. A unit capable of lowering intake temperatures is extremely important when dialling up the boost on a force-induced engine, and this dual-pass charge-cooler works in sync with a front-mount heat exchanger to keep the temperature of the water running within the system as low as possible. 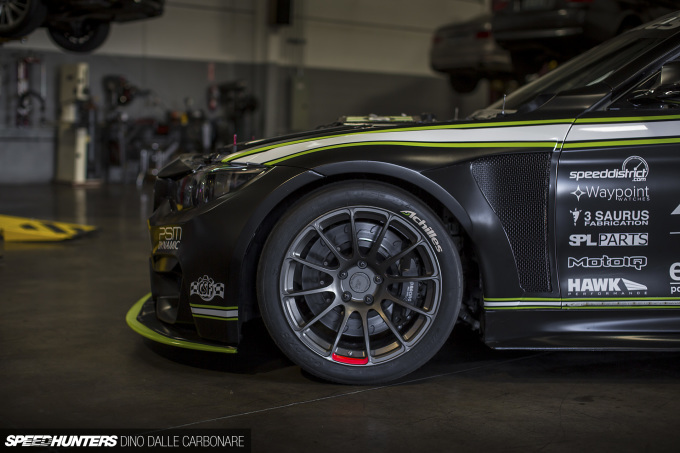 Yost had the main unit color-matched to the M4’s livery, but production versions will be offered in bare aluminum or with a powder-coated black finish. No power gains are being quoted for the unit quite yet, but the final production version (as seen here) is currently being tested and already returning some pretty solid improvements. Elsewhere around the engine bay, Yost had Gintani custom fabricate the twin intake pipes as well as the front pipes and exhaust system on the hot side of the engine, and overall reliability is further boosted by a CSF cooler for the transmission. On 91 octane fuel the M4 put down 506hp to the wheels with a massive 560lb-ft of torque. 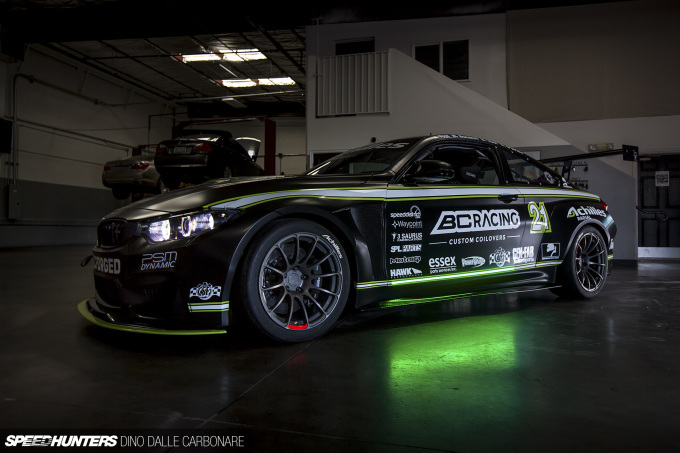 BC Racing supplied the custom DR Series coilovers that sit at each corner, mated to a multitude of SPL Parts suspension links to fine tune the geometry. 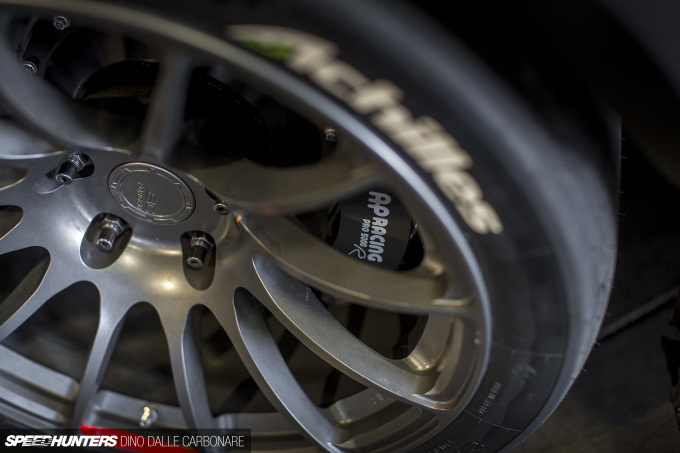 Behind the BC Forged RS43 wheels sit AP Racing Pro 5000 endurance-spec 6-pot calipers, which along with floating rotors are able to take the continuous abuse of 25 hours’ worth of racing. The M4 boasts a slightly wider body thanks to the addition of PSM Dynamic wide-body fender flares and a comprehensive aerodynamic package which includes an APR Performance rear wing, PSM front air dam, side skirt extensions and a rear diffuser. 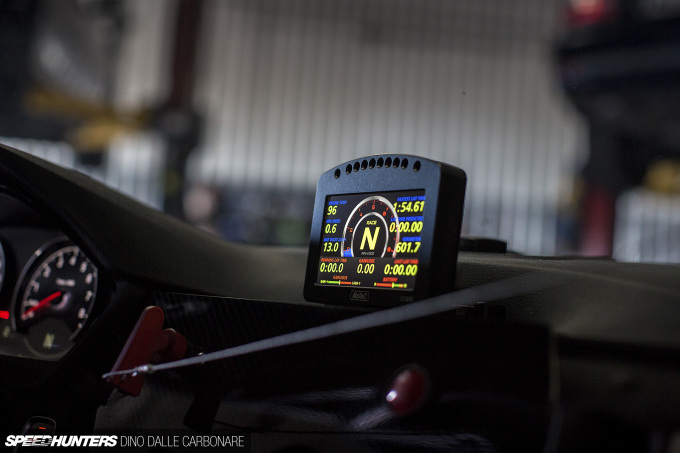 I quite like the side illumination and backlit numbers, a requirement in any form of endurance racing these days. 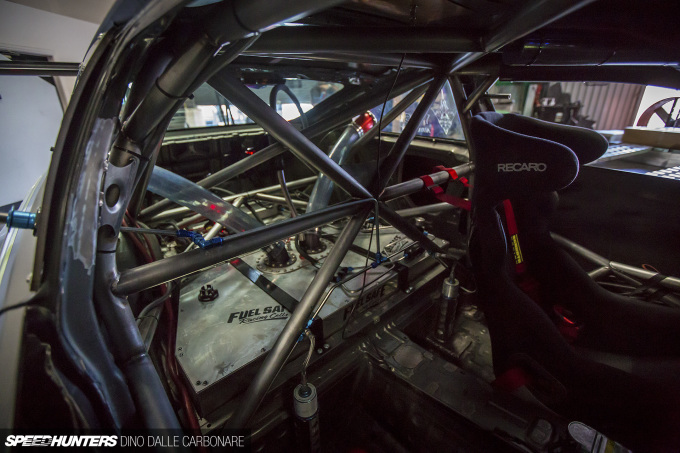 The full impact of the race car prep that has gone into the car really hits home once you take a peek inside the cockpit, which has been stripped right down to the metal. A MoTeC display logger joins the stock instrumentation to supply a variety of accurate temperature and pressure readouts from the engine and the management system, while the stock steering wheel has been replaced with an OMP unit which has pretty much every switch and control laid out in its center section. GenFab Motorsports was entrusted with creating the chromoly roll-cage, which is welded and gusseted to the chassis in numerous places. Right where the rear seat used to be is the 38-gallon Fuel Safe race fuel cell from which twin Aeromotive Phantom pumps pick up the gas and send it towards the engine. Four AP Racing air jacks have also been added to make pit stops easier and quicker; one twist of the pressurized air tank tap and the car rises off the ground. I had the guys at the shop remove the trunk cover as I wanted to get a shot of how the rear wing was mounted directly onto the chassis. It’s beautifully refreshing seeing a car built for competition, where every change, modification and upgrade has been made for a functional reason. It’s cars like these that everyone can learn from, be it if you are creating a car for the street or track use, or a bit of both. We wish the Yost Autosport team the best of luck at Thunderhill in a couple of weeks.